Veterans Administration hospitals have spent at least $420 million on solar panels and windmills while vets wait months — or even lay dying — to see a doctor. In total, VA hospitals reported 23 deaths due to 76 instances of delayed care, an April 2014 VA fact sheet said. Then on June 5, Acting Veteran Affairs Secretary Sloan Gibson revealed that at least 18 Phoenix patients died while waiting for treatment on a secret list kept off the books. It is not clear if that number is in addition to the 23 deaths reported earlier. During the past month, the scandal has resulted in the resignations of both the VA secretary and the leaders of its health care component. 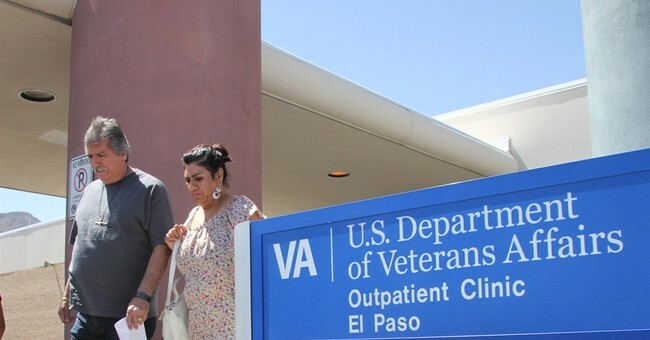 According to a June 3 audit, 100,000 veterans had lengthy wait times for appointments. Of the nation’s 216 VA hospitals, 37 percent will require further investigation. A whistleblower revealed Tuesday that seven of the patients listed on the Phoenix VA hospitals waiting list are already dead. That same Phoenix facility spent $20 million to build the nation’s largest solar carport. Phase one of the project was completed in 2011. The hospital also had an $11.4 million shortfall that year, an Inspector General’s report stated. Also in 2011, only 49 percent of first-time patients nationwide got a full mental health evaluation within the VA’s own goal of within 14 days after initial contact, the IG’s report said. On top of that, we have veterans not being treated properly for mental health issues. The VA’s own internal audit found that 62% of VA health facilities had at least one instance of veterans being pushed onto secret waiting lists. No wonder why virtually everyone thinks the VA scandal is a serious issue. After all, it seems that installing solar panels is more important than treating veterans.